It might only be February, but preparations by the Town Council’s festivities team is under way for a duo of fun events taking place in the town centre this summer. 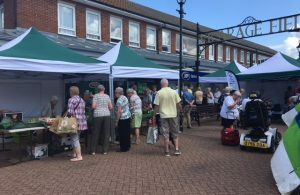 Plans for two different community events are in the initial stages, with organisation progressing well for the Hailsham Sussex Day and Hailsham Summer Market in June and July respectively. The Hailsham Sussex Day will take place in the town centre on Saturday 15th June from and organisers are pleased to be working with the town centre shops once again – it is hoped they will be offering discounts off their goods and special promotions on the day. The Long Man Morris Dancers and The Sussex Stompers will be providing live entertainment on the day and performance times will be announced soon. Hailsham Summer Market, which takes place on Saturday 20th July, is set to be a popular family event offering something for everyone. Vicarage Field will be home to street market stalls selling a range of locally sourced food, as well as gifts and accessories and there a specialist French Market, courtesy of traders Le Marche. Live music will be offered throughout the day, including performances from The Sussex Stompers, and Hailsham FM will be attending both events. For further information on event, please contact Karen Giddings on 01323 841702 or by email.